The first recorded minister of the congregation is the Reverend John Casper Bucher who formally organized the church on July 18, 1830. By this time, the congregation had already joined with the Lutheran Church in Burkittsville to erect a house of worship in the growing village. Work began on the initial structure in 1829 and continued through 1831. On February 19, 1831, while cutting timbers to construct the church’s rafters, the Reformed congregation’s patriarch, John Willard, was killed by a falling limb. Despite this setback, the congregation finished the building. 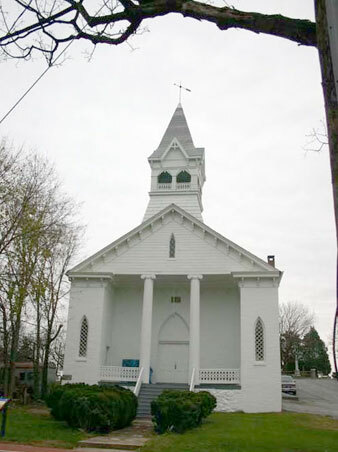 The two congregations shared this “Union Church” for 30 years. In 1859, the Lutheran congregation sold their part of the building and moved into their own church next door, today’s St. Paul’s Lutheran Church.. In 1941, after having sustained its own minister and charge for nearly a century, Resurrection Church was placed under pastoral care of Christ Reformed Church in Middletown. The congregation declined in number by the mid-20th century and by the 1970s had dwindled to three families. In 1979, the congregation closed the church, giving the building to the Town of Burkittsville to be preserved and used as a community center. In the early 1990s, South Mountain Heritage Society assumed responsibility of the building, conducting a major restoration between 1999 and 2003 to bring the church back to its 1896 appearance.